For enquiries about booking the Hall click here. The Warrandyte Mechanics Institute & Arts Association has been promoting all forms of the Arts in Warrandyte for more than 60 years. Most activities centre around our beloved Mechanics Institute Hall, located on the corner of Yarra Street and Mitchell Avenue, Warrandyte. For general enquiries about the WMIAA, contact Pat Anderson on 9844 3442, or by email. For more specific enquiries about any of the sub-groups, click the relevant link above. Past editions are available by clicking here. 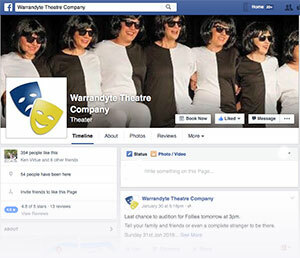 The Warrandyte Theatre Company has a very active Facebook group that you can view and join here.